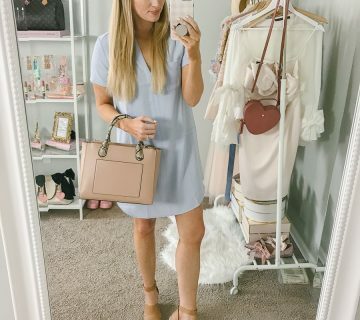 Dress: Fiore Boutique (old) / Belt: ASOS (old) / Scarf: Francescas (old) / Boots: Hunter in Lipstick Pink / Bag: LV / Watch: Kate Spade / similar options in widget below! This look is from this past Sunday after church and brunch. We ventured out and tried a new place, AND I didn’t get my usual eggs benedict. Change must be a comin! This look was my attempt to start that whole “transition” into fall, without giving up on summer just yet. I brought back out the Hunters and paired them with one of my favorite scarves (I mean anything in that color is a favorite). PS: I’m not quite sure why my hair looks super ombre in these photos. I swear I have mood hair that changes when it feels like it! Obsessed with your Hunters!! So cute paired with the lace dress! You look adorable!! I love this dress with the pink bots 🙂 Perfect for a rainy day! In love with the hunter boots, they definitely make rainy days something to look forward to! I have the dark purple Hunters and every time I see brightly colored ones I suddenly think I need another pair! Love the color of yours! So pretty!! 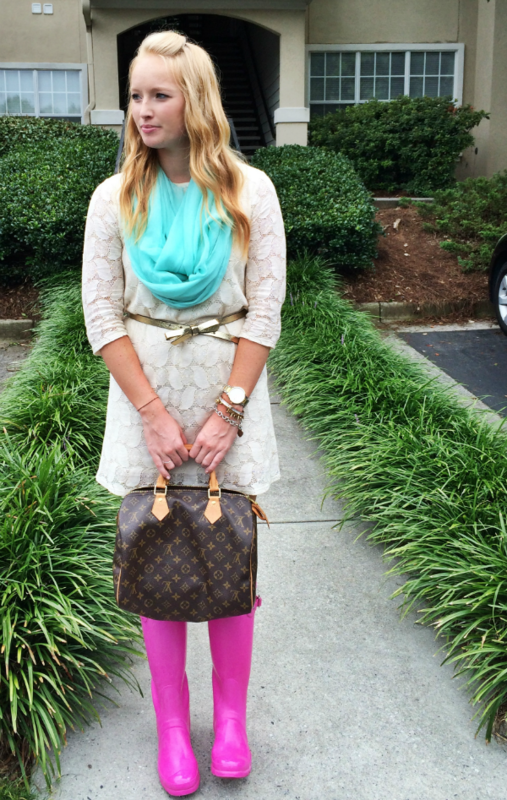 Loving the bright pick with the mint scarf! 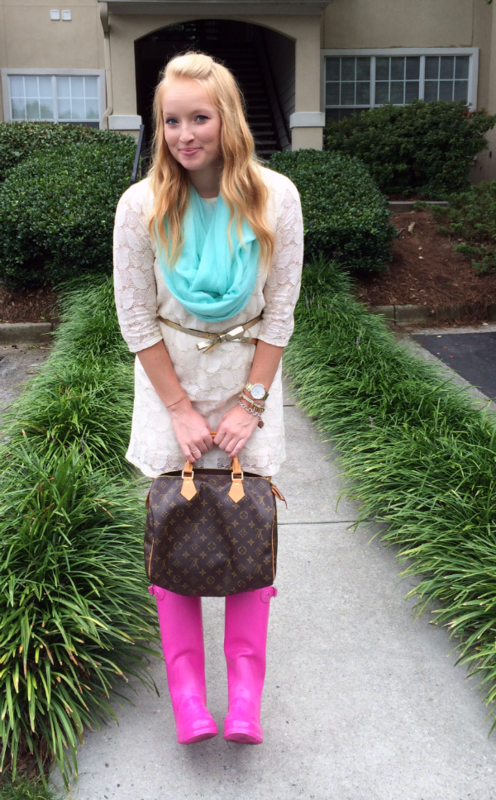 Such a perfect outfit to brighten a rainy day! Lovely outfit! i love the idea of wearing bright colors on a rainy day- it would help anyone feel happier! 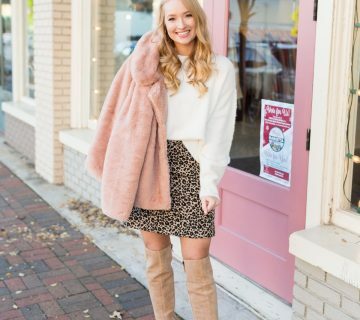 I love the pops of color from the scarf and the boots, and I can never resist a pretty bow belt – love this look! Adorable! Love that dress. Fabulous color boots! 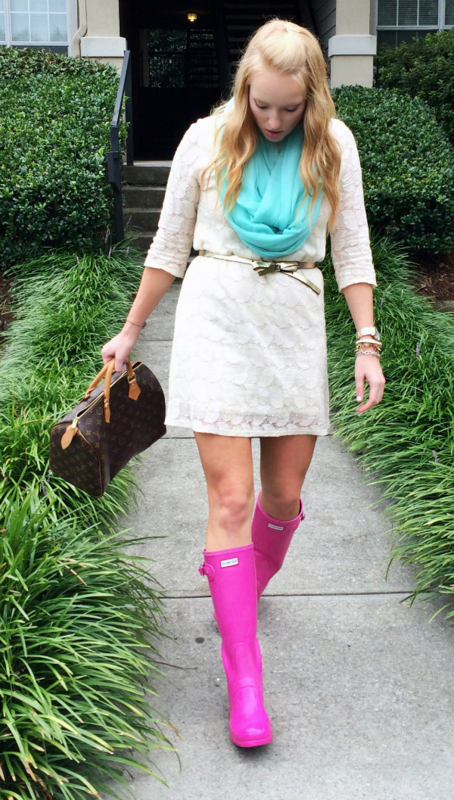 I love your pink rain boot look too! Great minds think alike! Cute idea to pair them with that adorable lace dress and scarf! I'm OBSESSED with your hot pink Hunters! They are the perfect pop of color–so cheerful and cute! 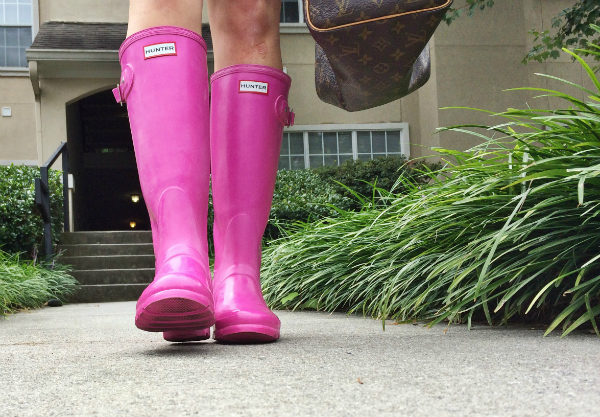 those pink hunter boots are so dang cute! darling look! Oh sweetheart you look adorable wearing your pink Wellingtons they are so pretty.